John Madden, Joe Gibbs and Dan Fouts sat together as Don Coryell disciples for their mentor’s 2010 memorial on San Diego State’s campus. They shared the same thoughts delivering eulogies, but Fouts admits Madden said it best. Madden’s eminent coaching and television voice shot through Fouts like a thunder bolt -- or an Air Coryell lightning bolt pass. Coryell is the reason, they readily acknowledge, they own a gold jacket that the Pro Football Hall of Fame awards to inductees each summer in Canton, Ohio. The Hall voters gather Saturday prior to Super Bowl LIII in Atlanta, and Fouts passionately hopes Coryell is elected this time. The coach that passed away at age 85 is again a finalist, an indication that respect is growing with perspective for his innovative passing offense over 14 years as an NFL head coach. Coryell turned losing franchises, the Cardinals and Chargers, into division champions at a time when the Cardinals competed with Roger Staubach’s Super Bowl Cowboys in the NFC East and the Chargers against the Super Bowl Raiders and Super Bowl Broncos in the AFC West. More significantly than the titles, though, Air Coryell began to push forward football 40-plus years ago to the 21st century’s modern game. His 1970s and 1980s teams posted unheard of numbers that are no longer uncommon. Many of his players benefitted with their first Pro Bowl trips. In 1979, Air Coryell’s seismic statistical shift was Fouts’ 4,082 yards passing. The 4,000-barrier previously hadn’t been crossed other than Joe Namath’s 4,007 with the 1967 Jets in the old American Football League. At the start of the 1980 season, some NFL pundits wondered if Air Coryell could repeat those numbers. They cautioned with defenses having an off-season to adjust, averaging 250 yards over 16 games to equal 4,000 was too much to ask. After all, in 1978, the Vikings’ Fran Tarkenton led the NFL averaging 216.8 yards for 3,468. Well, Fouts surpassed his 1979 numbers. In 1980, he threw for 4,715 (294.7 per game). He bumped them again in 1981, 4,802 (300.1). His 1981 total “edged” by 890 yards the NFL passing runner-up, the Vikings’ Tommy Kramer (3,912). The 1982 strike-shortened season prevented another 4,000-yard season, but Air Coryell found another NFL category – Fouts’ 320.3 yards per game. The record stood three decades until 2011; Drew Brees posted 342.3 and Tom Brady 327.2. In the 2018 season, 12 quarterbacks threw for 4,000 yards or more, ranging from Ben Roethslisberger (5,129) to Derek Carr (4,049). Fouts’ 4,000-yard seasons drove the Chargers to three straight AFC West titles, but eight of the 4,000-yard passers missed the 2018 playoffs. What was once shocking is part of the game. But Fouts believes the best example of Coryell changing the game in a copycat league was best illustrated by his dramatic influence on Don Shula, a Hall-of-Fame coach. Shula and the Dolphins won back-to-back Super Bowls with Hall of Fame QB Bob Griese completing 6-of-7 passes for 73 yards in Super Bowl VIII and 8-of-11 for 88 in Super Bowl VII. A decade later, Shula’s offense featured Dan Marino, the first quarterback to top 5,000. Marino threw for 5,084 (317.8), in 1984. Coryell’s fingerprints can still be lifted from the Super Bowl 32 years after his final game, in 1986. In the Super Bowl LII, Tom Brady threw for 505 yards and Nick Foles 373. An unwritten criterion for a quarterback to earn a gold jacket was an NFL title or Super Bowl championship, and Fouts agrees that should be a primary box to check. But recent Hall classes demonstrate standards have evolved from a 26-team league in 1970 to one that now numbers 32. Chipping away at that block began with Fouts as the first QB elected without a title in the Class of 1993. Warren Moon was the second in the Class of 2006. Marino entered sans a Super Bowl ring in 2005. Fouts believes such a perception change was applied to coaches with George Allen’s induction in 2002. He never won a Super Bowl with the Redskins (1971-77) or with the Rams (1966-70). His lone conference title season finished with a Super Bowl loss to Shula’s Dolphins. Coryell defenders say bad luck cost the Chargers the 1980 AFC championship game to the Raiders (34-27) and 1981 AFC title to the Bengals (27-7). The Raiders edged the Chargers with a fluke tipped pass Raymond Chester took 65 yards for a touchdown. They lost to the Bengals in a game known as the Freezer Bowl. The temperature in Cincinnati was a minus-9 degrees, with 27 mph wind and a wind-chill report that was minus-59 under the former index. But rather than excuses for two title games, Fouts blames the Chargers’ front office. He says it didn’t allow Coryell control of his personnel or coaches, explaining the front office fired defensive coordinator Jackie Simpson following the 1980 season. Simpson’s 1980 unit was ranked sixth in the NFL in total defense (293.2 yards a game). That season the Chargers’ defensive line of Fred Dean, Gary Johnson, Louie Kelcher and Leroy Jones – known as the Bruise Brothers -- led the league in sacks with 60. Dean, Johnson and Kelcher started in the Pro Bowl – the only time one team featured three defensive linemen as starters. “That was at a time when the Pro Bowl meant something to players,” Fouts added. In 1981, the front office named Jack Pardee as the defensive coordinator. It also traded Dean, a Hall of Famer, to the 49ers. That season Dean helped Hall-of-Fame coach Bill Walsh win his first San Francisco Super Bowl. Fouts noted that Pardee lasted only one year and then the scheme and personnel adjustments began anew under Tom Bass. Coryell’s candidacy has been hurt by the thought Hall-of-Fame coaches Sid Gillman and Bill Walsh preceded him as fathers of the modern passing game. “Don was equally if not more impactful,” Fouts said. “Walsh was my offensive coordinator with the Chargers (in 1976). When Coryell came to the Chargers we discussed Walsh’s weakside passing game that came to be known as the West Coast offense. Fouts believes defensive strategies that pulled a linebacker for a fifth (nickel) or sixth (dime) defensive back were directly related to Air Coryell. Fouts, laughing, says Steelers Hall-of-Fame linebacker Jack Lambert, who once said of quarterbacks “it might be a good idea to put dresses on all of them,” remains angry over nickels and dimes to this day. 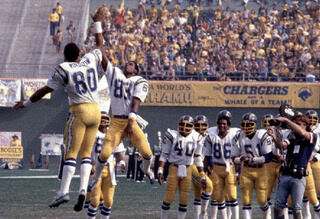 Another shocking Air Coryell statistic that has turned routine is receivers gaining 1,000 yards. In 1980, Air Coryell boasted the NFL’s first trio of 1,000-yard receivers – John Jefferson (1,340), Kellen Winslow (1,290) and Charlie Joiner (1,132). Among the eight NFL receivers to finish with 1,000 in a then-28-team league, they finished first, second and fourth. No other team had two 1,000-yard receivers. By 2018, there were 21 players with 1,000 yards receiving, but in a 32-team league, only four rosters featured as many as two 1,000 yarders. In the strike-shortened 1982 season, Chandler was the only player with 1,000 yards -- the Redskins’ Charlie Brown was second with 690 – and Chandler’s 1,032 in eight games set an NFL record of 129.0 per game. The record still stands. 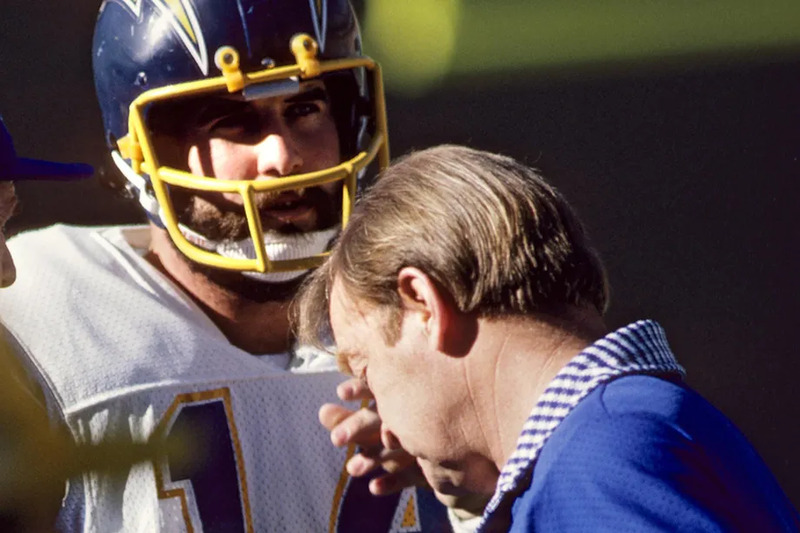 Fouts added the simplicity of Coryell’s offense, built around his system of digit routes he designed at San Diego State to help junior college recruits quickly learn the offense, aided a smooth transition from Jefferson to Chandler. One unintended consequence of prolific passing games has been the diva wide receiver. Ironically, Air Coryell was anti-diva. “We could have had divas, but Air Coryell, without a primary target, wouldn’t allow it,” Fouts said. “Our system required all the receivers to run routes hard because the defense’s response determined where I went with the ball. I had an idea who my target was, but I didn’t know for sure until the snap. On NFL.com, a page on the history of rule changes states the league pleads guilty to alterations designed to promote scoring and excitement. The page doesn’t mention Air Coryell, but as a byproduct of the offensive style, fans have accepted rules that promote throwing the ball, limit hits on the quarterback and more recent safety rules vital to the game’s future. One of the most significant changes was known as the 1978 Mel Blount Rule, recognizing the Steelers’ Hall of Fame cornerback’s success disrupting receivers at the line of scrimmage. From that season forward wide receivers were allowed five yards off the line of scrimmage before they could be bumped. Fouts adds Coryell was quick to exploit the new rule with motion. Fouts, who was drafted out of Oregon five years before Coryell joined the Chargers, adds the College Football Hall of Fame got it right when Coryell was enshrined in the Class of 1999. He remains the only coach with 100 wins in college and the NFL. Coryell’s San Diego State years lit up college football on Saturday nights while developing many future NFL players, among them Brian Sipe, Issac Curtis, Haven Moses, Don Horn and Dennis Shaw. 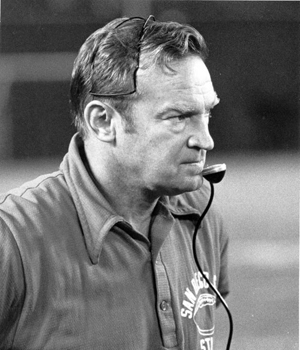 Madden coached under Coryell at SDSU before he was the Raiders’ head coach. Gibbs and played and coached under Don at SDSU and with the Chargers before he was the Redskins’ head coach. Another Coryell identity was his quirky personality that fueled humorous on-and-off-the field stories, but Fouts and Madden both say don’t confuse mad scientist with eccentric football genius. At Coryell’s memorial, Madden explained the coach’s “amazing concentration powers” led to the funny stories. Fouts also cited Coryell’s fearlessness. He wasn’t afraid to throw the ball out of the end zone to loosen up the defense. And in the Chargers’ epic 1981 overtime playoff win against at Miami, Fouts completed a crucial fourth-and-one pass to Winslow. The time-honored phrase “seven degrees of separation” applies to a long list of names connecting Coryell to those that achieved the Hall of Fame or simply fame. “Don belongs in the Pro Football Hall of Fame,” Fouts said. “If my words aren’t enough to convince you, listen to John Madden."